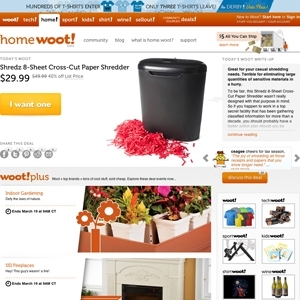 On October 24, 2011 Woot launched their site 'Home.Woot'; a site that offers a highly discounted deal on household goods once a day. So if you are looking for a way to turn your house into a happy home for less, this is the place to check out! Home.woot.com currently ranks #12 amongst sites offering online deals -- DX Offers ranks #11. In the Home and Garden category, Home.Woot ranks at #2 -- Home Depot ranks #1. Home.Woot is considered the most popular deal a day site, ranking in at #1. As for the 2nd most popular site, it's Giveaway of the Day.